George Washington suffered from poor dental health throughout his adulthood; beginning in his twenties he experienced regular toothaches, decay, and tooth loss. These problems were likely due to factors common during Washington's era, including a poorly balanced diet and disease, as well as genetics. As a result, he spent his life in frequent pain and employed a variety of tooth cleaners, dental medicines, and dentures. These dentures are in the collection at Mount Vernon – the only remaining full-set in existence. 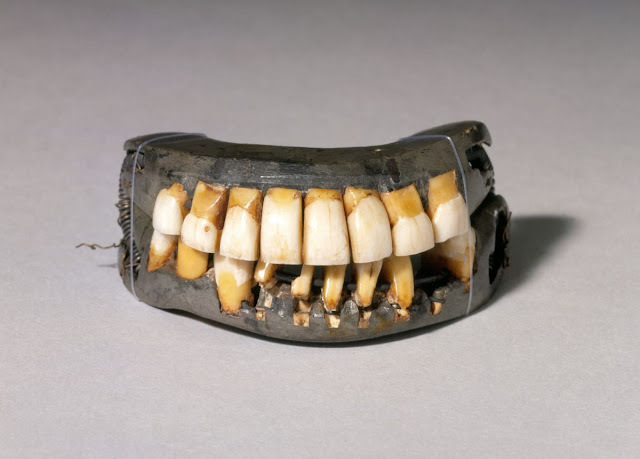 Contrary to later legend, none of Washington's false teeth were made of wood. Prior to Washington's service in the Revolutionary War, Dr. John Baker, the first dentist to fashion false teeth for Washington, fabricated a partial denture with ivory that was wired to Washington's remaining real teeth. In the 1780s, Washington employed the services of Jean-Pierre Le Mayeur, a French dentist living in America, but it is unclear precisely what dental services Le Mayeur performed. Le Mayeur probably fashioned a partial set of false teeth for Washington; the Frenchman also advertised he was experienced at "transplanting... put[ting] natural teeth instead of false," but no definitive evidence indicates he attempted such operations on Washington. Le Mayeur and Washington quickly became friends, and Le Mayeur was a guest at Mount Vernon on multiple occasions in the mid-1780s. Print of John Greenwood, from the American Journal of Dental Science, 1839. Courtesy of the Library of Congress. When Washington was inaugurated President in 1789, only one real tooth remained in his mouth. Dr. John Greenwood—a New York dentist, former soldier in the Revolution, and a true pioneer in American dentistry—fashioned a technologically advanced set of dentures carved out of hippopotamus ivory and employing gold wire springs and brass screws holding human teeth. 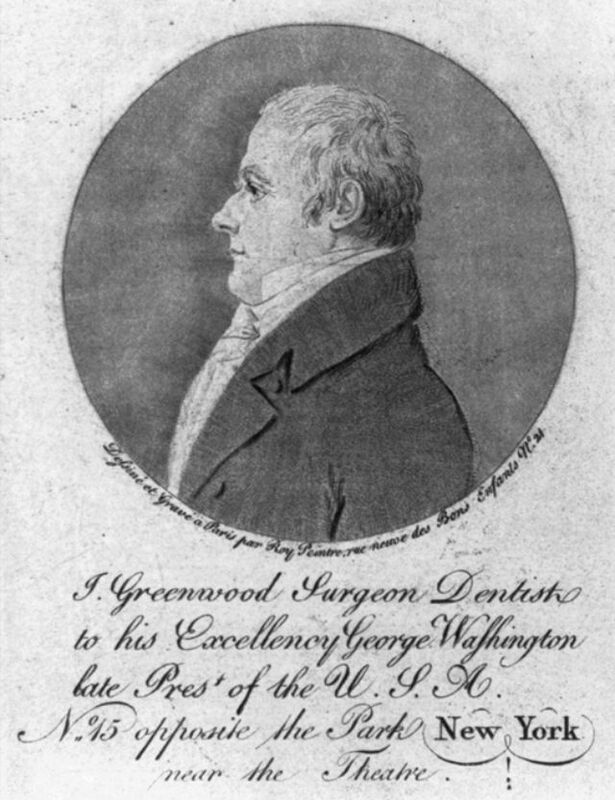 Greenwood even left a hole in the dentures to accommodate Washington's single tooth as he believed a dentist should "never extract a tooth... [when] there is a possibility of saving it." When Washington finally lost this tooth as well, he gave it to Greenwood who saved this cherished item in a special case. All of Washington's dentures caused him pain and produced facial disfigurement, described by George Washington Parke Custis as "a marked change... in the appearance... more especially in the projection of the under lip." This physical change can be viewed in the well-known portraits painted by Gilbert Stuart in 1796. Washington complained that even the expertly constructed dentures made by Greenwood "are both uneasy in the mouth and bulge my lips out" and that the teeth "have, by degrees, worked loose." Courtesy of the New York Academy of Medicine who generously lent this partial pair of dentures to Mount Vernon, September 2009 – June 2013. Not surprisingly, Washington found his ivory and metal contraptions difficult to use while eating or speaking. The ivory dentures also tended to stain easily, requiring extensive maintenance such as cleaning with wax and "some chalk and a Pine or Ceder stick" and "soake[ing]... in Broath." Presently, a few of Washington's false teeth still exist. 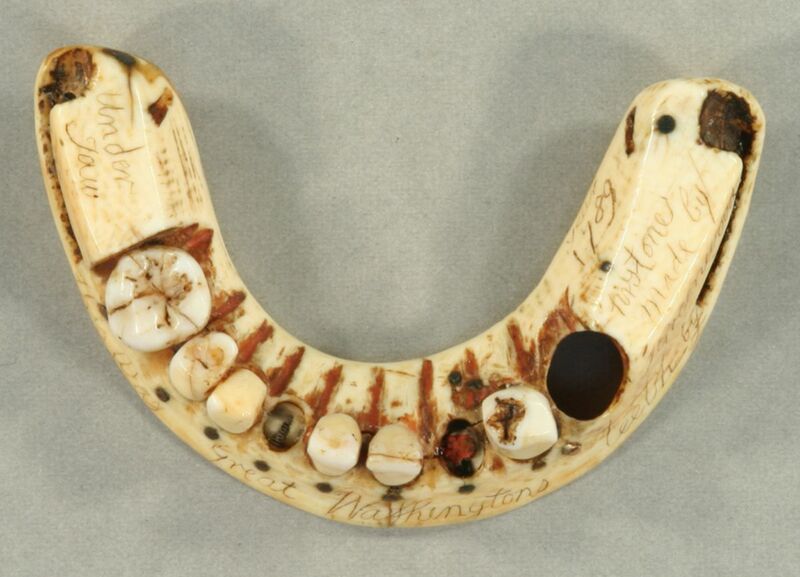 Part of a denture made by Greenwood is owned by the New York Academy of Medicine as is the decorative case holding Washington’s last tooth. The only complete set of Washington's dentures that still survives is preserved by the Mount Vernon Estate and Gardens and is made of animal and human teeth, lead, and ivory.